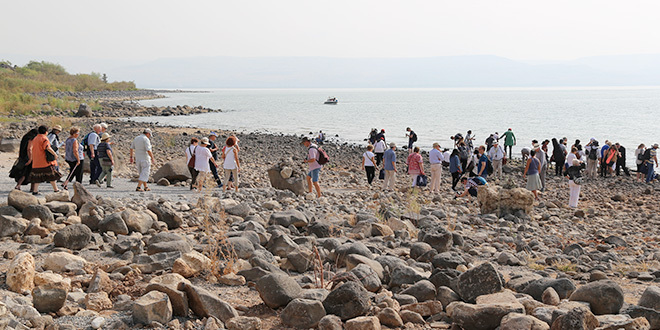 CHRISTIAN pilgrims flock to the shores of the holy Sea of Galilee to visit the sites where Jesus performed healing miracles and walked on water. Yet when they reach the rocky shoreline they find the famous waters are receding after five years of drought that some Israelis fear heralds a wider water crisis connected with climate change. “The water should come to the level of the breakwater,” boat captain Nonyo Kapuza said, pointing to a faded mud line about six metres higher than the current water level. For the past 15 years, Mr Kapuza has taken sightseers out onto the lake aboard his replica Bible-era fishing boat Noah 902. He is more concerned about the shrinking shoreline after a series of dry winters than he is about the wild storms that can whip up without warning, just as it is recorded in the gospels. “The water is now at the lowest level since measuring started a century ago,” Mr Kapuza said. 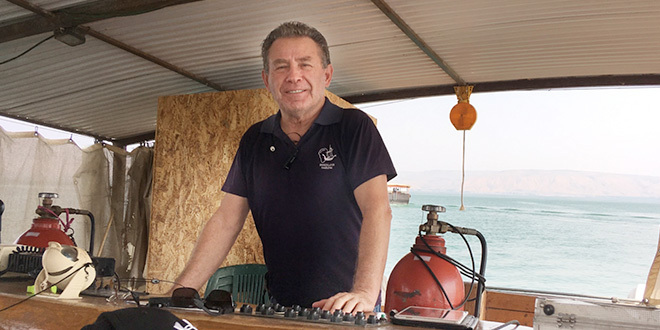 Watching over decline: Captain Nonyo Kapuza, of the tourist vessel Noah 902, sees a sinking shoreline on the Sea of Galilee. Situated 200m below sea level and 45km from the coast, the Sea of Galilee, or Lake Kinneret, is the lowest freshwater lake in the world. Until a decade ago it was one of Israel’s main sources of drinking water, fed partly by underground springs although its main source is the Jordan River which flows through it from north to south. Underneath the large lake run subterranean saltwater streams. Pressure from the fresh water in the lake prevents this saltwater from entering the lake. It is feared that if the water level drops too much, the saltwater will mix with the fresh, making the entire lake unsuitable for general use. Against a backdrop of parched, bare mountains this poses a great danger of water shortages for biblical towns like Nazareth and Cana, and across the rolling slopes running down to the lake, where Jesus preached to his followers and are now irrigated farmlands that produce oranges, bananas and persimmons. Any change in salinity would also immediately impact fish stocks, the livelihood of fishermen, and the dozens of tourist eateries like Ali’s Restautrant that serve carp, mullet and tilapia (rebranded as St Peter’s fish) to busloads of visitors each day. 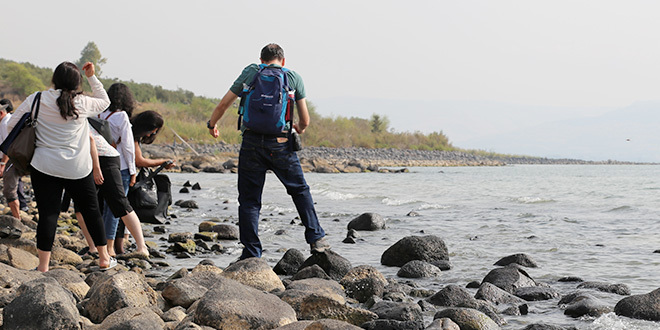 Troubled waters: Visitors to the Sea of Galilee see a lake shrinking after years of drought. With extreme drought conditions continuing to intensify, Israeli authorities are rallying to stop the water level from plunging below a point where irreversible ecological damage to the lake might take place. In June, the Israeli cabinet approved an emergency scheme to build two new desalination plants – adding to five existing desalination plants along its Mediterranean coast. One of the new plants, west of the Sea of Galilee will pump desalinated seawater into the lake for the first time, starting next year with small quantities of desalinated water, and reaching an annual volume of 100 million cubic metres of water within four years. It could take a decade to learn whether this measure can save the Sea of Galilee but, for Israel, finding a solution to its water woes it is a matter of high national resource security. Desalination already provides Israel with about 70 per cent of its drinking water and the current drought is endangering the fate not only of the Sea of Galilee, but the downstream Jordan River and the Dead Sea – where there are major tourist and pilgrimage sites and regions of rich-soil agriculture. “It’s not raining anymore – this is the problem,” Haim Benami, a guide with Israel’s Tourism Ministry, told a group of visitors to the Golan Heights where springs feed into the headwaters of the Jordan River before reaching the Sea of Galilee. 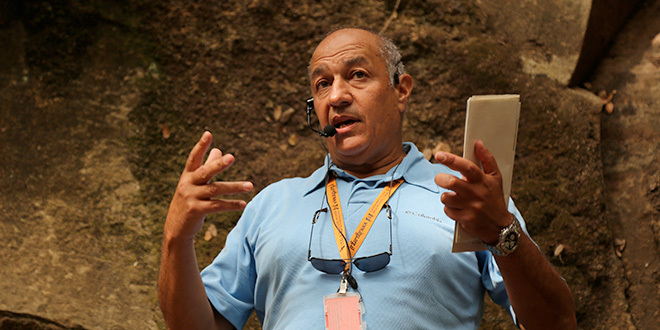 Concerned: Tour guide Haim Benami. It is a place of cascades and crystal-clear water, but Mr Benami has witnessed the springs slowly depleting. “I see the differences, especially over the last decade,” he said. Water plays a major part in the development on the Golan Heights, a strategic buffer between Syria and Israel, now in Israeli hands after the land was annexed during the 1967 Six Day War. But without more access to water, expansion plans will slow to a trickle.